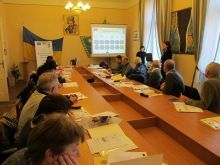 On November 24-25, the joint EU/UNDP “Community Based Approach to Local Development” (CBA) Project held trainings for ACMB co-owners in Lviv region. 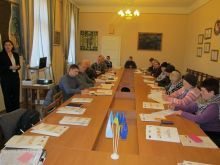 Project experts Leonid Tulovskyi, urban component specialist, and Larysa Batchenko, engineer of the Project, held trainings in Zolochiv and Drohobych on “Technical aspects of MPPs preparation and tranche reporting within CBA-III Project” and “Research and analysis of regulatory and legal framework of ACMB activities”. Participants learned about legal aspects of ACMH creating and conducting, efficient management of residential buildings (energysaving, roof and watersupply maintaining measures), ACMB partnership with housing and communal services and local self-governance bodies. Participants also got acquainted with technical aspects of microprojects’ preparation and implementation in their own communities.